When asked what my first language is, I often answer, “visual.” I think in images, prefer to be taught through images, and like to express what I know through images. I find it disconcerting that as learners progress to the higher grades, there is less use of images and visuals to teach concepts. We are incredible at remembering pictures. Hear a piece of information, and three days later you’ll remember 10% of it. Add a picture and you’ll remember 65%. Professionals everywhere need to know about the incredible inefficiency of text-based information and the incredible effects of images (http://www.brainrules.net/vision). Using visuals, images, video, and other visual media to teach and demonstrate concepts. Using and teaching learners how to make concept maps. Using and teaching learners how to do sketchnotes. Allowing and encouraging learners to show what they know through visual imagery. Our brains are wired to rapidly make sense of and remember visual input. 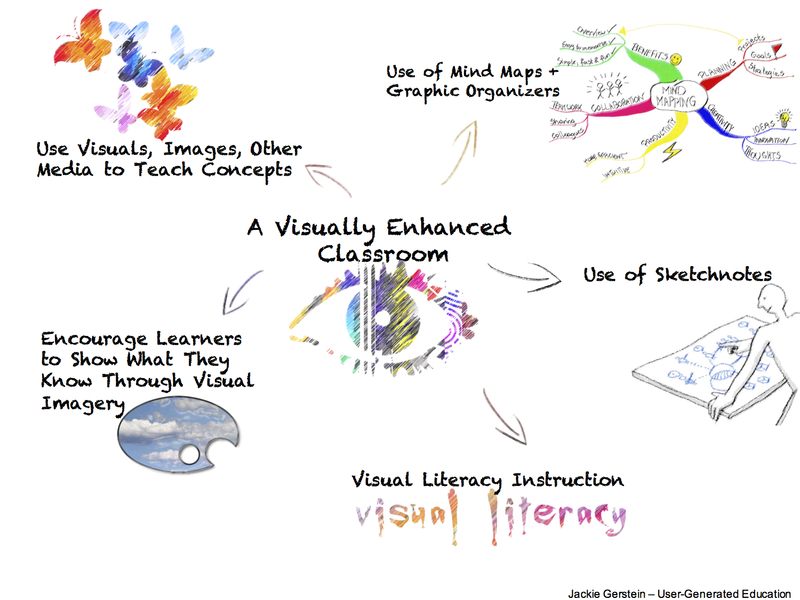 Visualizations in the form of diagrams, charts, drawings, pictures, and a variety of other ways can help students understand complex information. A well-designed visual image can yield a much more powerful and memorable learning experience than a mere verbal or textual description (http://cft.vanderbilt.edu/guides-sub-pages/visual-thinking/). Because of all of the multimedia available to teachers, there has been an increased use of visual presentation of content in the classroom. Educators, though, should assess their visual impact. Youtube videos of talking heads or PowerPoint presentations that are text based just reinforce instructional systems too heavily dependent on the verbal and written word. The use of slide presentations by educators help to provide visual stimulus for their learners. They tend, though, to be way too text based as satirized in Life After Death by PowerPoint by Don McMillan . Truthfully, I am a strong proponent of using PowerPoints for teaching given that they are image rich and text limited. Garr Reynolds or Presentation Zen provides tips for preparing presentations that honor the use of visuals in Top Ten Slide Tips. Concepts can also be demonstrated through data visualizations and infographics. Strategies for using data visualizations and inforgraphics in the class can be found at Data Visualized: More on Teaching With Infographics. Research tells us that the majority of students in a regular classroom need to see information in order to learn it. Some common visual learning strategies include creating graphic organizers, diagramming, mind mapping, outlining and more. These strategies help students or all ages better manage learning objectives and achieve academic success. As students are required to evaluate and interpret information from a variety of sources, incorporate new knowledge with what they already have learned, and improve writing skills and think critically, visual learning tools help students meet those demands. Paired with the brain’s capacity for images, visual learning strategies help students better understand and retain information (http://www.inspiration.com/visual-learning). For more ideas for using mind maps in the classroom, see 10 Mind Mapping Strategies For Teachers. Sketchnotes are rich visual notes created from a mix of handwriting, drawings, hand-drawn typography, shapes, and visual elements like arrows, boxes, and lines (definition from Mike Rohde, The Sketchnote Handbook). Although sketchnoting was born out of the need to take better notes at conferences and in meetings, I believe the process of making sketchnotes may have tremendous educational value for students and professionals. This is especially true for students who struggle taking traditional notes or need a fresh approach to learning. Please keep in mind that this is about ideas, not art (The Sketchnote Handbook) (http://campus.murraystate.edu/faculty/jcox/sketch.html). I discuss Sketnoting in more detail in my post – Visual Note-Taking. Such alternatives reduce media-specific barriers to expression among learners with a variety of special needs, but also increases the opportunities for all learners to develop a wider range of expression in a media-rich world (http://www.udlcenter.org/aboutudl/udlguidelines/principle2). If we think of literacy as reading and writing words, visual literacy can be described as the ability to both interpret and create visuals. With the constant, overwhelming flow of information and communication today, both parts of this modern literacy equation are non-negotiable (http://gettingsmart.com/2015/07/the-new-literacy-equation-visual-literacy-is-non-negotiable/). Teaching visual literacy helps kids better interpret art and visual media that they come in contact with. Visual literacy allows a deeper interaction with texts of all kinds and introduces the process of analytical thinking about representation and meaning. There is evidence that, even for older children, examining and understanding how art and text interact may allow readers to “visualize” while they read–a key to proficiency in and enjoyment of reading. By teaching “educated perception” of artwork (for instance, how certain techniques elicit specific emotions or effects) you can teach children how to be more skeptical and informed viewers of all visual media, including advertising (http://ccb.lis.illinois.edu/Projects/youth/literacies/visual2.html). I have long been a fan of multiple representations. We can even take it a step further by providing multiple interactive representations of content. The interactivity invites the learner to ask “What happens if …”, and helps them move towards being an active learner. Luckily, my chosen topics, mathematics and physics, are well represented by visualizations and simulations. For example I have some interesting experiments at http://www.vizitsolutions.com/portfolio/gausslaw/ around electric fields, which present 2d, 3d, explanitory text and mathematics all of which are interactive. This shows that we can generate much richer, multiplatform, content. Loved this! May we re-post on the bigblog.org ? Thank you for sharing this. We are doing a “cave painting/storytelling” mini-unit on the 2nd week of school this year. (Tied into sticker and street art culture) this is a great resource for our mini unit.